Last year I posted here about how well all the pepper plants did in September when things cooled off just a little. Half way through the month it appears 2011 will be no different. 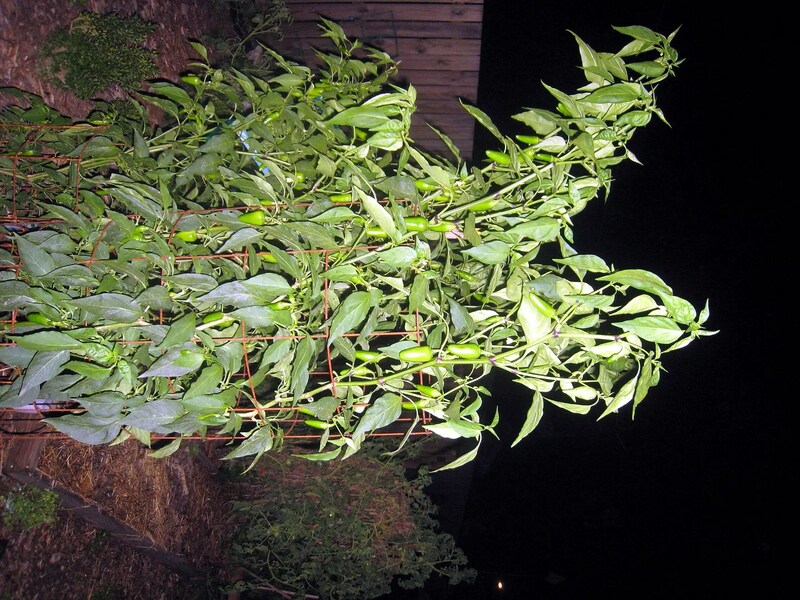 The jalapeno “twins” in one of the back beds are now 6+ ft tall and caged/staked to keep the branches from breaking. I have harvested around 150 jalapenos so far this season and my best estimate is that I have another 200-250 on the 4 plants right now. The jalapenos are invisible to a camera during daylight so I tried a flash to bring them out yesterday evening; it worked a little better, so here is a shot of the bigger plants (the front one is the 6’+ one). Nutrition in a capsaicin wrapper, what’s not to like? Beautiful plants! Are they a particular variety of jalapeno? I had 100% germination indoors and set 10 or 11 plants out. squirrels pulled up 4 or 5 (grrr), the one I put in a pot had the earliest yield but stopped in late July, 1 is tiny and covered with peppers (maybe 20″ tall and now double staked), one was shaded too much early by herbs and is tall and lean (only a few peppers all year), and three are 4-6′ tall and heavy producers. I have been picking these aggressively when they are big enough to stuff and this seems to have stimulated production; I’ve only let a few get to the “mature” size where they get the darker color & stretch marks. Man, I got a bad case of Pepper Envy LOL Nice looking peppers.